To subscribe or unsubscribe from any of Springshare's email newsletters, you need to go no further than your LibApps account settings. Navigate to your LibApps dashboard. Not sure how? Look at the blue button in your orange navigation bar: if this says "LibApps", then you're in the right place! If it doesn't (e.g. it says "LibGuides", "LibAnswers", etc. ), click on that button and select "LibApps" from the dropdown. You can use this same menu to navigate back once you're done. Click on My Account in the orange navigation bar. 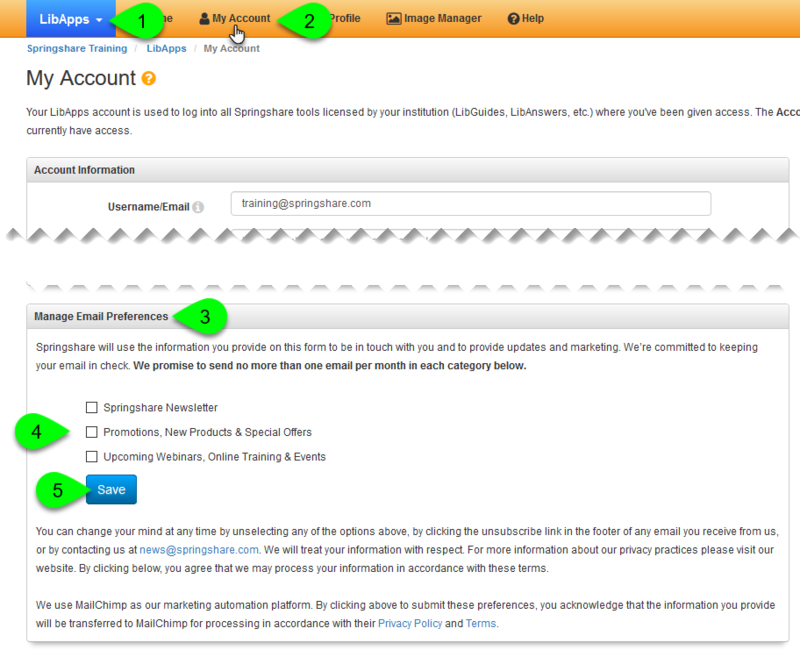 On the My Account page, scroll down to the Manage Email Preferences box. Use the checkboxes next to each newsletter option to subscribe or unsubscribe. If a box is checked, that means you are subscribed to that newsletter. Deselect the box if you would like to unsubscribe from it. If a box is unchecked, that means you are not subscribed to that newsletter. Select the box if you would like to subscribe to it. Once you've finished making your changes, click the Save button. Springshare will use the information you provide in your email preferences to be in touch with you and to provide updates and marketing. We’re committed to keeping your email in check. We promise to send no more than one email per month in each newsletter category. You can change your mind at any time by deselecting any of the checkboxes (see Step 4 above), by clicking the unsubscribe link in the footer of any email you receive from us, or by contacting us at news@springshare.com. We will treat your information with respect. For more information about our privacy practices please visit our website. By clicking below, you agree that we may process your information in accordance with these terms.